See It, Snap It, Scrap It! : Drop Into the Zone Release!! Imagine if you will ... entering Hollywood Studios at Disney World and rushing down Hollywood Boulevard ... turning right on to Sunset Boulevard and racing to the Tower of Terror ride! Well, if that sounds like you then you are going to LOVE this kit. The Mad for the Mouse team went crazy with Freebies this go around!! Your Freebies can be found at Holly's Blog, and Christy's Blog, as well as Ali's Blog, and of course my blog (see below)!! We're not done yet .... Karrie's Blog has one and so does Lisa's Blog! 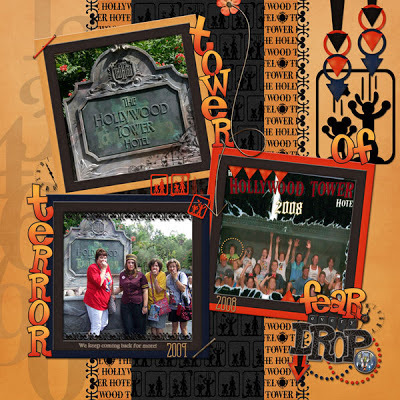 Here is a layout I made using my freebie. There are so many wonderful papers and embellishments in this awesome kit ... and don't forget the word art and page starters!!! Go get 'em! 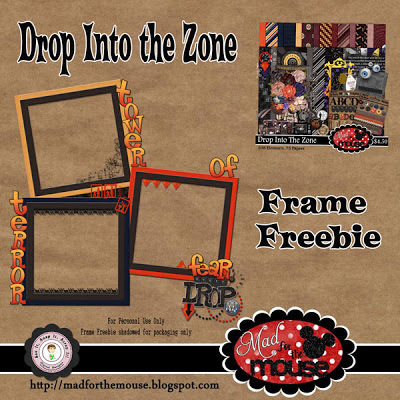 All you have to do is click below on the Frame Freebie to download. Hope you have as much fun with this kit as we did!! 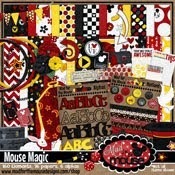 Make sure you stop by Mad for the Mouse to get this awesome kit!! Thank you for the awesome freebie!!!! thanks for the freebie for ToT!! Love your frame cluster! Thank you for sharing.